Beautiful 100% cotton for Stoffabrics of a quirky, stylised smiling cats on a pearly grey background. Fun and bright with lots of character. 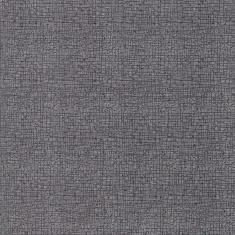 Price is for HALF a metre length, 50 cm x 1.10 metres wide (including selvedge). if ordering more it will be in a continuous length. Beautiful 100% cotton for Stoffabrics of a quirky, stylised street map with houses , flowers and smiling cats on a pearly grey background. Fun and bright with lots of character. By Lynette Anderson and made in Japan, this is a delicate collection of subtle, quiet colours and patterns and designs. The same designs are produced on various background colours from a slate blue grey, muted dusky pinks to lavender greys. This is a charmingly simple pattern of flowers on a lavender grey subtly patterned background. 100% cotton, 110cm wide. Sold by the HALF metre. Orders for more than 1 unit will be cut as a continuous piece.. This is a charming pattern of simple flowers with bees and ladybirds on a lavender grey subtly patterned background. Charmingly vintage style imagery from dressmaking patterns . 100% cotton, 110cm wide by 50cm. This is a lovely design in black and grey on a pale ground. Very simple but very appealling. Charmingly simple design of interrupted rows of small crosses . 100% cotton, 110cm wide by 50cm. This is a lovely design in grey on a pale ground. Very simple but very appealling. 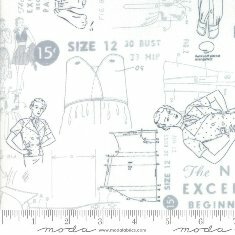 Part of a collection of soft, nostalgic, yet modern designs from Moda. 100% cotton, 110cm wide by 50cm. 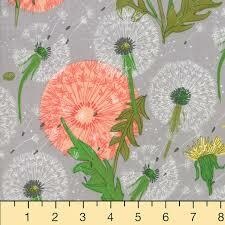 This is a wonderful design of dandelion clocks and flowers, all on a soft grey background. A mid grey ground with darker, fine, wandering grid lines. Gives an impression of woven texture rather than pattern. Very useful. If this is too much fabric , try the charm pack which is 5" squares. Part of a range of bright modern prints from Moda. 100% cotton, 110cm wide by 50cm. This is a strong and quirky design of stylised farm animals in 2 sizes (large panels 12" x 14.5"). Very simple but very appealling designs. 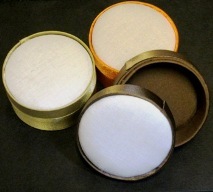 Co-ordinating fabric is available by the metre or as a layer cake. 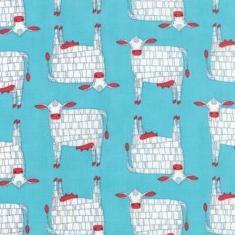 This is a strong and quirky design of stylised cows in white with touches of red on a clean bright blue background.. Very simple but very appealling. 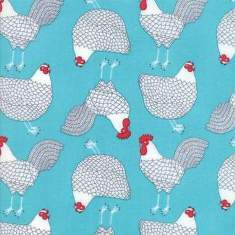 This is a strong and quirky design of stylised chickens in white with touches of red on a clean bright blue background.. Very simple but very appealling. This is a strong and quirky design of multi coloured scallops on white. Very simple but very appealling. This is a strong and quirky design of hand drawn dashes in bright blue on white. Very simple but very appealling and so useful. Part of the Holly Woods collection by Moda. Delicate but bold, almost Jacobean stylised floral pattern in deep red on a neutral cream background. 100% cotton, 110cm wide by 50cm. 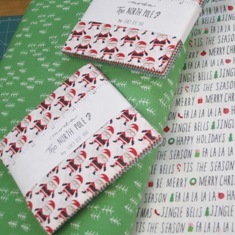 Part of the Holly Woods collection by Moda. Delicate sprigs of leaves and white flowers on a neutral fawn background. 100% cotton, 110cm wide by 50cm. Part of the Holly Woods collection by Moda. Deep red spots and dots on a neutral cream background. 100% cotton, 110cm wide by 50cm. Combine with the jelly rolls or layer cakes for a sophisticated winter themed quilt. .
Part of the Holly Woods collection by Moda. Delicate pattern of tiny stars and minute dots on a light fawn background. Very subtle. 100% cotton, 110cm wide by 50cm. 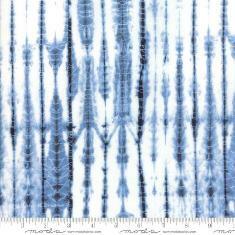 Part of a range of Shibori style prints from Moda. 100% cotton, 110cm wide by 50cm. 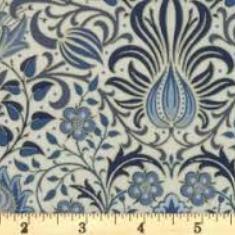 This is a lovely open pattern of classic indigo blue and white. Very simple but very appealling. This is a lovely irregular linear pattern in classic indigo, mid blue and white. Very simple but very appealling. 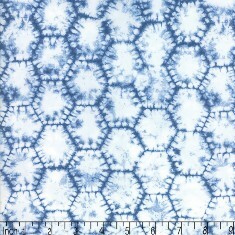 This is a lovely irregular pattern of classic indigo blue and white. Very simple but very appealling. Part of the charming Weather Permitting from Moda. 100% cotton, 110cm wide by 50cm. Combine with the jelly rolls or layer cakes for a sophisticated weather themed quilt. 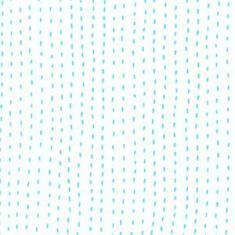 This is a lovely soft blue with drawn open dots in white to represent raindrops. Very simple but very appealling. 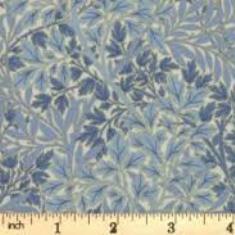 This is a lovely delicately shaded fabric in a delightful vintage blue. Very simple but very useful. This is the pale cream with rows of ting winter trees in shades of blue and green. 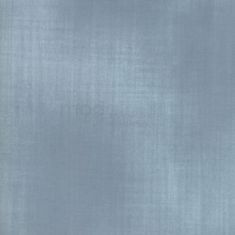 This is the palest grey blue with a scattering of small white stars. This is a lovely vintage green with a scattering of small white stars. very pretty apple blossom like flowers on cream . to order one metre , order two units . any multiple of units will be sent as a piece . 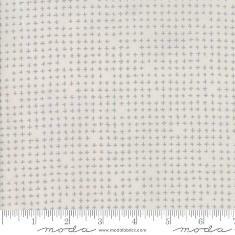 100% perfect cotton quilting fabric as we are used to from Moda . 110 cm wide cotton fabric. A fat quarter measures 50cm x 55cm. at last great to back your quilt ... to order one metre , order two units . any multiple of units will be sent as a piece . to order one metre , order two units . any multiple of units will be sent as a piece .
. fifth one down on pic. Beautifully colourful printed cotton fabric, A scattering of highly decorated cats in jewel-like colours and outlined in gold. 50 cm x 110cm. wide. These are the same cats featured on the Multi- panel, but printed smaller, each approx 11cm high. The background is white with small irregular subtle grey blocks. The price is per half metre.. Beautifully colourful printed cotton fabric, Stylised and decorative hearts in jewel-like colours, outlined in gold, on a white background. 50 cm x 110cm wide. The hearts are densely packed, each roughly 2- 3cm across. The price is per half metre. 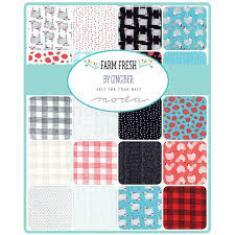 We have coordinating fabrics from the same range available. Beautifully colourful printed cotton fabric, Stylised and decorative hearts in jewel-like colours, outlined in gold, with black cats playing between them, all on a white background. 50 cm x 110cm wide. The hearts are roughly 4-5cm across. first class quilting cotton . great print .strong and straight . you almost feel like it should make a noise ! Beautiful printed cotton fabric, delicate stylised foliage and flowers, partially printed in gold on a deep blue background. 110cm wide. The price is for a half metre. Beautifully colourful printed cotton fabric, delicate stylised foliage and flowers, partially printed in copper on a pale background. 110cm wide. Beautifully colourful printed cotton fabric, delicate stylised foliage and flowers, partially printed in copper on a soft pink background. 110cm wide. Beautifully colourful printed cotton fabric, delicate stylised foliage and flowers, partially printed in copper on a dark blue background. 110cm wide. Beautifully colourful printed cotton fabric, delicate stylised foliage and flowers, partially printed in gold on a soft pink background. 110cm wide. Beautifully colourful printed cotton fabric, delicate stylised foliage , partially printed in gold on a soft off white background. 110cm wide. Beautifully colourful printed cotton fabric, delicate stylised foliage , partially printed in gold on a soft pink background. 110cm wide. Beautifully colourful printed cotton fabric, delicate stylised foliage , partially printed in copper on a soft sage green background. 110cm wide. Beautiful printed cotton fabric, delicate stylised peacock feather heads in a repeating in gold on a pale background. 110cm wide. Beautiful printed cotton fabric, delicate stylised peacock feather heads in a repeating in gold on a red background. 110cm wide. Beautiful printed cotton fabric, stylised repeating pattern of peacocks and foliage. Details on the peacock printed in gold, on a pale background. 110cm wide. Beautiful printed cotton fabric, stylised repeating pattern of peacocks and foliage on a pale blue background.Details on the peacocks printed in copper. 110cm wide. Beautiful printed cotton fabric, stylised repeating pattern of peacocks and foliage on a blue background. 110cm wide. Beautiful printed cotton fabric, fun and stylish design of puffins on a pale blue background. 110cm wide. Beautiful printed cotton fabric, fun and stylish repeating design of coloured dolphins on a pale background. 110cm wide. Intricate , irregular dots within dots of blues, stone and gold. all on a dark blue background. 110cm wide. Price for a HALF METRE, if ordering more it will be in a continuous length. Intricate , irregular dots within dots of blues, stone and gold. all on a white blue background. 110cm wide. Intricate , irregular dots within dots of pinks,blues, stone and gold. all on a white background. 110cm wide. Printed cotton fabric, 110cm wide. beautiful drape . Elegant and intricate foliate design of stylised leaves, flowers and fruit in blues, outlined in gold, on a delicately off white background. 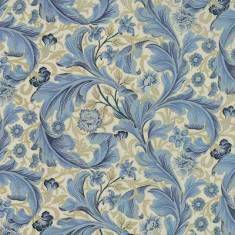 A classic Morris design, copyright to The V & A Museum, London. 100% cotton, 110cm wide. Price is for a HALF METRE, if ordering more it will be in a continuous length. Informal, repeating design of branches of fruit trees in soft blue foliage, outlined in gold, on a delicately off white background. A classic Morris design, copyright to The V & A Museum, London. 100% cotton, 110cm wide. Beautifully soft blue and fawn foliage and flowers, outlined in gold, twining boldy across a soft off white background. A classic Morris design, copyright to The V & A Museum, London. 100% cotton, 110cm wide. 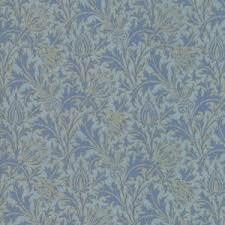 Beautifully soft blue foliage in a delicate formal repeating pattern, outlined in gold, on an off white background. A classic Morris design, copyright to The V & A Museum, London. 100% cotton, 110cm wide. Beautifully soft blue thistle design, outlined in gold, on a pale blue background. A classic Morris design, copyright to The V & A Museum, London. 100% cotton, 110cm wide. Intricate foliage design in dark and mid blue, outlined in gold, on a delicately off white background. A classic Morris design, copyright to The V & A Museum, London. 100% cotton, 110cm wide. Beautifully soft blue foliage, outlined in gold, on a delicately off white background. A classic Morris design, copyright to The V & A Museum, London. 100% cotton, 110cm wide. Lovely crisp fabric yet has a lovely drape to it so perfect for quilting, dress making and many more home sewing projects. Charming vintage sewing machines on a neutral background.. Beautifully understated Danish design on 100% cotton printed fabric covered in tiny simplified dotted flowers. Soft turquoise blue background. Beautiful Danish design on 100% cotton printed fabric covered in diagonal patterns of purple simplified buds . Soft purple background. Beautiful Danish design on 100% cotton printed fabric covered in diagonal patterns of pale simplified buds . Soft turquoise background. Charming, understated Danish design on 100% cotton printed fabric covered in diagonal patterns of purple simplified flowers . Soft purple background. Beautiful 100% cotton printed fabric covered in simple flowers of blues and ochre. Off white background. Beautiful 100% cotton printed fabric covered in swirling patterns of blue dots . Mid blue background. Beautiful 100% cotton printed fabric covered in swirling patterns of grey dots . Light grey background. Beautiful 100% cotton printed fabric regular pattern of dots and informal circles. Blue background. Beautiful Danish design on 100% cotton fabric printed with a subtle purple woven surface - much softer in appearance than a solid plain colour without being a pattern. Produced for Studio E Fabrics on 100% cotton fabric, printed with lively and bright octopus on a light blue ground. Part of a series with a co-ordinating panel. Produced for Studio E Fabrics on 100% cotton fabric, printed with brightly coloured fish packed head to tail in coloumns on a white ground. Part of a series with a co-ordinating panel. Quirky, simplified Mediterranean houses and pots on a soft blue/black ground. Quirky and charming - printed with a dense pattern of crochet flowers . Quirky and charming - colourful printed crochet squares on a dark ground. Beautiful 55%linen 45%cotton mix printed fabric. 1.50 metres wide (including selvedge). Price is for HALF a metre length, if ordering more it will be in a continuous length. Soft but heavier than the standard weight quilter's cotton, and could be be used for so many projects in and around the home. Ideal for bags, soft furnishings, even a quilt. This is a neutral background with little soft purple hearts scattered across it. Beautiful 55%linen 45%cotton mix printed fabric. 50 cm x 1.50 metres wide (including selvedge). 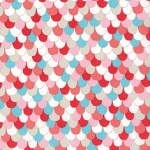 This is a neutral background with small soft blue hearts scattered across it. This is a soft purple background with little pale dots scattered across it. This is a blue background with small light dots scattered across it. This is a deep red background with small light dots scattered across it. This is a neutral background with small purple flowers scattered across it. This is a neutral background with script running across the width of the fabric and dotted with little purple flowers. This is a neutral background with small red flowers scattered across it. This is a neutral background with small soft red flowers scattered across it. This is a neutral background with a red geometric line pattern. This is a neutral background with a blue geometric pattern. This is a neutral background with a repeating scroll and flower pattern. Beautiful 100% cotton soft blue printed fabric full of a delicate summery old world charm, featuring large sprays of vintage style roses. Beautiful 100% cotton soft blue printed fabric full of a delicate summery old world charm. Beautiful 100% cotton printed fabric full of a delicate summery old world charm. Recency style stripes of twining roses with a tiny, delicate pattern inbetween. Beautiful 100% cotton softly dotted blue printed fabric with delicate sprigs of roses. Very pretty and delicate design. 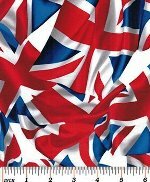 Price is for HALF a metre length, 50 cm x 1.10 metres wide, if ordering more it will be in a continuous length. Beautiful 100% cotton soft blue printed fabric with subtle pale blue branches of roses. Very pretty and delicately understated design. 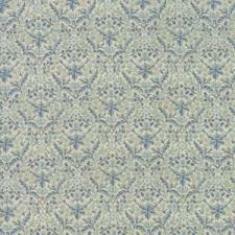 Beautiful 100% cotton soft blue printed fabric with pale dots and posies of roses. Full of a delicate summery old world charm. A delicate leaf white on white. 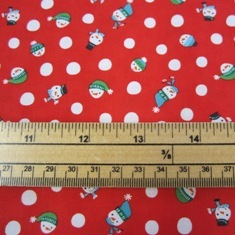 2.75m (108") wide, ideal for seamless quilt backing. First class printed cotton quilting fabric, 110cm wide. Wonderfully bright and colourful pattern of balloons, great for making bunting, party bags as well as for quilting. Printed cotton fabric, 110cm wide. Printed cotton fabric by Chong-A Hwang, 110cm wide. A strongly coloured design of red poppies against green foliage on a black background. Looking for something even more dramatic? then take a look at the panel of poppies against a sunset that goes with this! Bright and lively design of decorative elephants. Printed cotton fabric, 110cm wide. Price is for a metre length, if ordering more than 1 it will come as a continuous piece. Rows of charming, smiling cat faces on a pretty pink background. Printed cotton fabric, 110cm wide. Rows of charming Dachshunds wearing colourful coats on a white background. Printed cotton fabric, 110cm wide. Intricate curls in sparkling silver and white on a soft blue and grey ground. 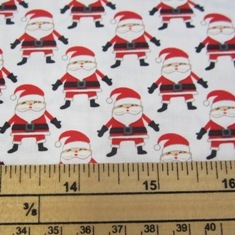 Light, effortless and completely charming, a very useful addition to the Christmas fabric stash. . Printed cotton fabric, 110cm wide. Timeless Treasures " Gail" (Playing Cards). C6274. 1 x 1.1m piece . Tumbling playing cards on a green ground. Printed cotton fabric, 110cm wide. 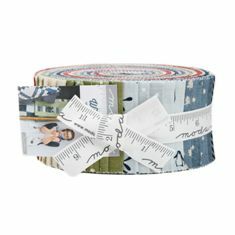 Order more than one metre and it will come as a continuous piece! A scattering of simplified vintage style tractors in bright, vivid colours on a white background. Printed 100% cotton fabric, 110cm wide. Price is for a HALF metre length, if ordering more than 1 it will come as a continuous piece. Great, fun pattern of cows on a vibrant red background. Printed 100% cotton fabric, 110cm wide. A charming design of yellow chicks and white hens scattered over a lively orange background. Printed 100% cotton fabric, 110cm wide. Fantastic pattern of Summer clouds on a light blue background. Printed cotton fabric, 110cm wide. Continuous sea patterns in blues. Printed cotton fabric, 110cm wide. Lots and lots of tiny owls on cream background , bright colours and so decorative. Printed cotton fabric, 110cm wide. Swirling turquiose, gold, purple and blue in beautiful intricate designs. Very rich and glamourous. Printed cotton fabric, 110cm wide. 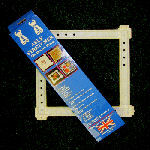 Price is for a metre length, if ordering more than 1 it will come a continuous piece. Very stylised and intricate floral designs in purple, turquiose, gold, and blue on a deep black background. Very rich and glamourous. Printed cotton fabric, 110cm wide. Timeless Treasures " Enchanted Plume" by Chong-A Hwang 3551 1 x 1.1m piece . Blues, purples and greens, outlined in gold. This is a sumptuous design, very rich and decorative. Printed cotton fabric, 110cm wide. Timeless Treasures " Alexandria" by Chong-A Hwang 1 x 1.1m piece . Blues and greens, outlined in gold. This is a sumptuous design, very rich and decorative. Printed cotton fabric, 110cm wide. Timeless Treasures " Enchant" by Chong-A Hwang CM5875 1 x 1.1m piece (butterflies). Beautifully detailed and elegant butterflies in blues, purples and greens, outlined in gold on a pale blue ground. This is a light and charming design, very rich and decorative. Printed cotton fabric, 110cm wide. Order more than one metre and it will come as a continuous piece. Timeless Treasures " Sakura" by Chong-A Hwang CM6162 blue 50cm x 1.1m piece . An oriental themed range, beautifully printed in rich colours with bright gold detailing. This is a delicate geometric in full tones of blue with touches of red and green in the floral central motifs. Printed cotton fabric, 110cm wide. Sold as half a metre, order more than one and it will come as a continuous piece. We have a lovely picture panel and 2 other designs from this range available. 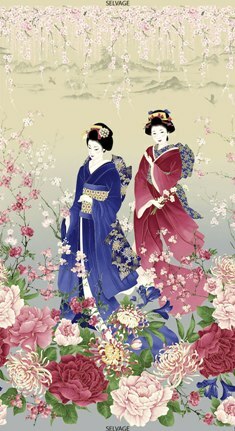 Timeless Treasures " Sakura" by Chong-A Hwang CM6160 blue 50cm x 1.1m piece . An oriental themed range, beautifully printed in rich colours with bright gold detailing. This is a dramatic chrysanthemum design in full tones of blue with white and gold.. Printed cotton fabric, 110cm wide. Sold as half a metre, order more than one and it will come as a continuous piece. 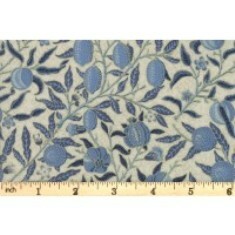 Windham Fabrics: Enchanted Foerst by Betsy Olmsted. Pattern 43499 Hedgehogs. Beautiful printed cotton fabric, fun and quirky design of hedgehogs on a pale blue background. 110cm wide. Beautiful printed cotton fabric, fun and quirky design of rabbits in a field of mushrooms on a pink background. 110cm wide. Beautiful printed cotton fabric, a colourful and quirky design of hedgehogs, rabbits and birds in a woodland setting. on a pale blue background. 110cm wide. 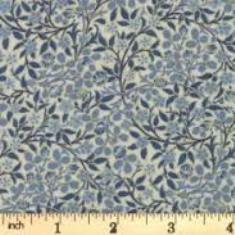 Windham Fabrics: Enchanted Foerst by Betsy Olmsted. Pattern 43502 Aqua. Beautiful printed cotton fabric, repeating pattern in shades of teal and aqua on a deep teal background. 110cm wide. 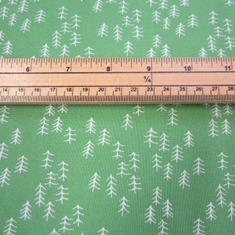 Beautiful printed cotton fabric,repeating design in shades of green on a mid green background. 110cm wide. Beautiful printed cotton fabric, a repeating design in shades of pink on a rich pink background. 110cm wide. Vibrant and lively, stylised vases on a white background. 110cm wide. Vibrant and lively, stylised flowers on a rich green background. 110cm wide. Vibrant and lively, stylised flowers on a deep pink background. 110cm wide. Vibrant and lively, stylised flowers on a rich purple background. 110cm wide. Colourful and playful, rows of irregular triangle on a light green background. 110cm wide. Colourful and playful, rows of irregular triangle on a pink background. 110cm wide. Scattering of playful, irregular shapes on a light green background. 110cm wide. Scattering of multi- coloured playful, irregular shapes on a white background. 110cm wide. Scattering of blue playful, irregular shapes on a mottled purple background. 110cm wide. Charming, playful, irregular line check in dark and mid blue on a light blue background. 110cm wide. Charming, playful, irregular line check in light and mid pink on a deep pink background. 110cm wide. Charming, playful, irregular line check in light and mid yellow on a rich deep yellow background. 110cm wide.